The most important question asked this week is: Are apples alkaline? The answer is clearly yes from the Acid-Alkaline Fruits and Fruit Juices Food Chart, but that chart only tells part of the story. The story is only complete when you eat apples as part of a healthy balanced diet. That depends on what else you eat, and how you serve the apples. One day, I’ll give you a healthy recipes plan that includes apples. In the meantime, I will explain the importance of alkaline apples with a new Alkaline Fruit List. 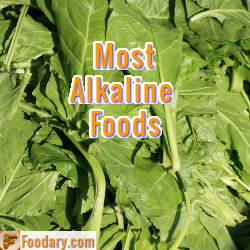 I will update all the Alkaline Food Lists because the old Acid-Alkaline lists have many failings. There is still room for improvement, but the new lists will pave the way for a recipe-based system. This is necessary because simple lists take food out of context. They are good for seeing if one food is better than another in isolation, but this has limited value. As a first step to improving my alkaline foods lists, the new lists are calorie-based and include more important nutritional information. The easiest way for me to explain is to show you the list. Then if you click on any link within the table, you will see an explanation. The alkaline fruits list is presented in order of descending alkalinity, but you can click column headings to sort by description or any nutrient. Note that the pH effect of food is only one aspect of a healthy diet, so please click on the links within the list for a more complete explanation. What alkaline fruit is on your top table? As you can see, all fruits, or at least all fruits from the key foods list, have an alkalizing effect on the body. Fruit should form around one-sixth of your total calorie intake. That means, on a recommended 2000 calories per day diet, you should eat around 300 calories from the above list. A small glass of juice is OK, but eating fruit is much healthier. Fruit is recommended particularly for its rich range of vitamins and other nutrients that help make your body healthier. The downside is the high sugar content. Of course, a reasonable amount of natural sugar is a good part of your diet. Therefore, fruit will provide all the sugar you avoid adding refined sugar. Fruit is generally high in fiber, which is essential to good health. So, you can see that apples are alkaline, but avoid overeating them as the sugar content is high. Replacing some apples with pears is an easy change that is slightly healthier, with equal alkalizing effect. If you have any questions about this Alkaline Fruits List, please ask in the alkaline fruits discussion.